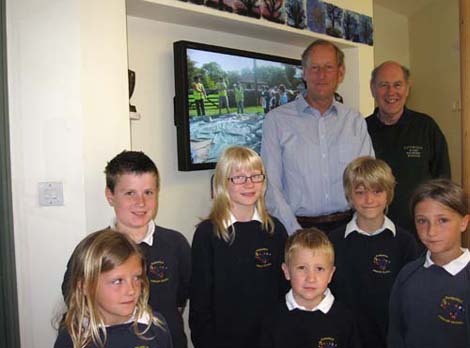 School children at Marshfield School with Project Manager David Adams and Cotswold Conservation Board's member David Colbourne showing the new display installed in the reception area. David Colbourne looks approvingly at the equipment provided to the school using funding provided by the Cotswold Conservation Board Sustainable Development Fund. 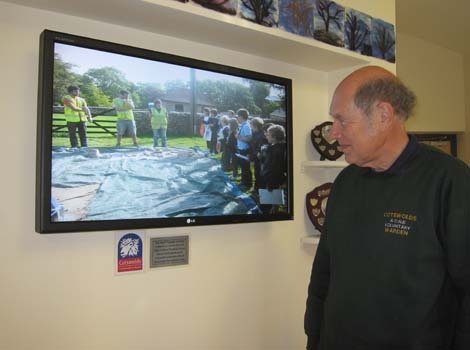 The funding provided by the Cotswold Conservation Board Sustainable Development Fund has enabled us to provide a laptop computer and a display screen for use at Marshfield School. The monitor has been installed in the entrance to the school and the staff have set up the software. This has allowed the provision of a constantly rolling presentation of the work done by the children resulting from their involvement in the West Littleton heritage and conservation project. The information displayed includes film, photographs and writing. The children are gaining considerably from this new equipment which allows them to create records and displays which provide a long term resource both for those directly involved and those who follow. Marshfield Primary School’s involvement with the West Littleton Project has inspired the children’s enthusiasm for the history of the surrounding area and the importance of conserving its heritage. The digital equipment provided by the West Littleton PCC and funded by the Sustainable Development Fund is helping the School to continue its active interest in the history and heritage surrounding St James’s Church, and is providing opportunities to involve the local community more widely and engage their support in the ongoing learning programmes. We are confident that this wider involvement is helping to develop an increased and sustainable interest in the conservation and enhancement of the area’s special qualities.